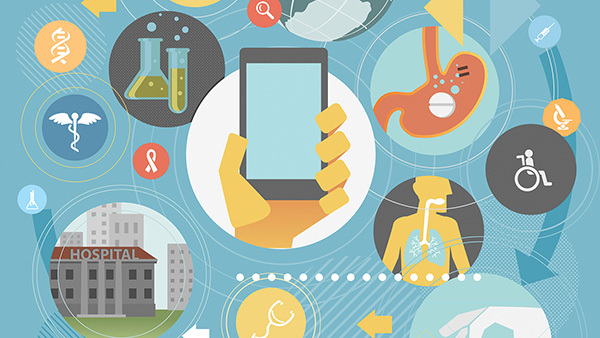 As digital health care technology becomes more advanced, there's a growing delineation between clinical-focused technology and devices that focus on health and wellness. Technology helps consumers manage more of their health care on their own. As digital health care technology becomes more advanced, there’s a growing delineation between clinical-focused technology and devices that focus on health and wellness, Vaughn Kauffman told Investment Advisor in April. Kauffman is a principal in PwC’s Health Industries Advisory Services. Consumer-focused health care technology is becoming more cost effective, he said, in part due to startups in Silicon Valley. PwC found that by mid-2014, digital health care startups had raised $2.3 billion, more than they raised for all of 2013. More than $200 million of that went to devices like wearables. Do-it-yourself strep or ear infection tests help consumers decide if they need a doctor or if they just need rest and fluids. Kauffman said the need for more convenient, less expensive care is pretty even across all demographics, but is especially strong in the 35- to 64-year-old age group because they’re most likely to be managing not just their own care, but their children’s and their parents’ as well. Over half of clinicians are comfortable with using mobile apps and devices to monitor patients’ vital signs, according to a December study from PwC’s Health Research Institute. Eighty-six percent of clinicians said that technology will become more important to doctors over the next five years. However, the survey also found doctors may be more comfortable with “DIY” health care than consumers. Although half of doctors surveyed by PwC said they would use data gathered by patients using a home urinalysis device to prescribe medication or decide whether to set an appointment, just one-third of consumers agreed. Regulation is another driving force in the preponderance of health and fitness technology that serves the consumer. A lot of those companies don’t want to be more than a pedometer integrated with the cloud because, as Kauffman explained, the regulations imposed on a simple wearable device that counts your steps and monitors your calorie intake are less onerous than a full-fledged FDA-approved medical device. “That’s why we often say new entrants are coming into health care on the health and wellness side because it’s an easier sandbox to play in,” he said. And there’s still an adoption issue. Although one in two consumers say they’ll probably buy a wearable device in the next year and one in five consumers already own one, only one in 10 of those use it every day, according to Kauffman. “Part of the problem is that the data that it’s collecting doesn’t provide any meaningful insight. Typically the people who are buying it are the fitness fanatics who are healthy already,” Kauffman said.